What a great time in music…. I remember Rich Podolsky contacting me and mentioning his forthcoming book. During the past couple of weeks, I’ve seen copies of it showing up on eBay. 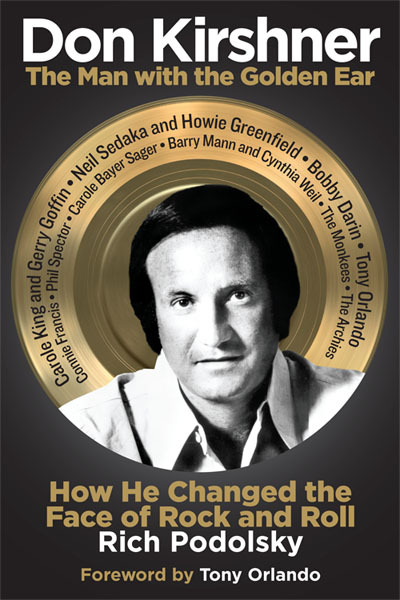 Don Kirshner was the man behind the careers of so many singers and songwriters that it’s high time a book’s been devoted to him, and past time that he got into the Rock and Roll Hall of Fame! Not a minute too soon for either of these. Donnie was a great musical and entertainment visionary. While music is what he is best known for, do not forget his “Rock Concert” was the precursor to MTV, VH1 and so on. Along with Bob Rafelson and Bert Schneider, Donnie was key in the success of the Monkees, a perfect mixture of music and television. Robi Keller…What a great book!!!! Boy has the music business changed. I was married to Jack Keller for over 40 years and have not heard some of the stories. Richard did a great job. Tom Adams…I just ordered it! Tom DeCillis…I remember Don giving me a tour of his new offices with Al Nevins under construction at 1650 Broadway. Later in life Don lived a few miles from me and I had a printing business that he frequented. He wanted to resurrect Rock Concert and had me photo copy his entire catalog of music he owned including some Beatles material. He was offering this as collateral to investors so he could syndicate the old tapes. Visited his home in Cedar Grove,NJ a few times and kept in touch till I moved out of state. Harvey Cooper…As an ex-RCA man..I knew first hand the power of his music..
Steve Binder…When I created and directed the “Rock Concert” series for Don, he complained that the audiences were complaining that they couldn’t read his name on the signage because I was being too creative and tilting the sign. I told him to fly in from New York and change it himself…and I quit on the spot.